A-B male-male USB adapter included for programming your Arduino. 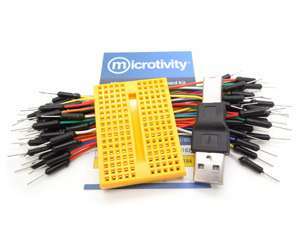 This mini-breadboard and jumper wires kit is ideal for making electrical connections and for testing purposes. A USB A-B male-male adapter is included for programming your Arduino. The breadboard has 170 point with standard 0.1" (2.54mm) pitch. Packaged in a zip lock bag. Why Mini Breadboard kits: The mini breadboard is prefect for experimenting small projects, to serve as a secondary circuit of a larger circuit, etc. They are also nice to be used in size-constrained circumstances like being part of a artwork. The included jumper wires can help you to make connections between components quickly. They are in different colors and therefore so it will be easier to trace the circuit.